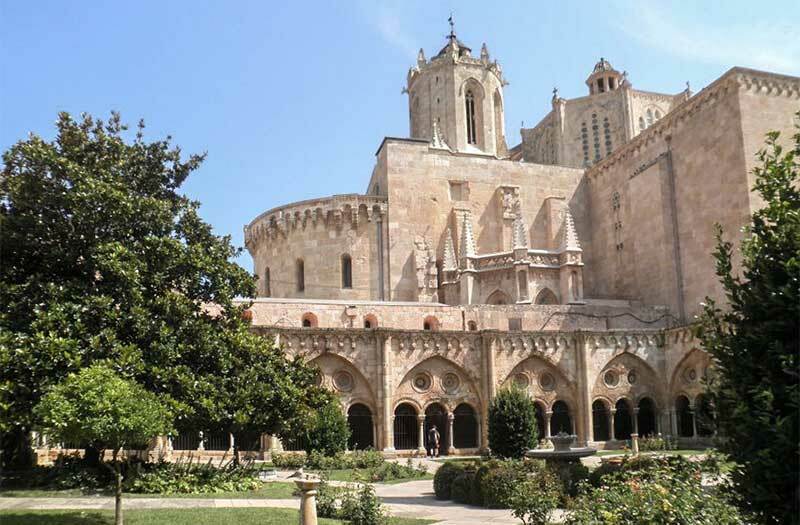 The Cathedral of Tarragona is a Roman Catholic church located in Tarragona. Tarragona was the capital of Roman Spain. The Cathedral was constructed on a site previously occupied by a Roman temple that dates back to the time of Tiberius. The cloisters are 12th and 13th Century, anre are accessed through a Romanesque gate from the 13th century. It is located northeast of the cathedral and was constructed around 1194 to 1214. Laid out in a rectangular plan the cloisters measure 47 by 46 meters. The large central courtyard are walled by four galleries divide by pilasters. Someof the gutters move the rainwater into a sewer built by the Romans. The covering vault is similar to the model of Poblet and Vallbona de les Monges. The arcades are organized in groups of three smaller circular arches, surmounted by couples of small rose windows and, above them, a large ogival arch. Above the latter is in turn a frieze in Moorish style. The capitals of the columns are sculpted with religious scenes, such as the visit of the angels to Abraham, Cain and Abel an others. At the corner of the northern gallery are scenes from the Genesis and the New Testament, St. Thomas' incredulity and the legend of St. Nicholas. The wall of the eastern gallery includes an Arab inscription from the year 960, belonging to the former mosque. It has a tympanum with the Majesty of God and the Tetramorph. 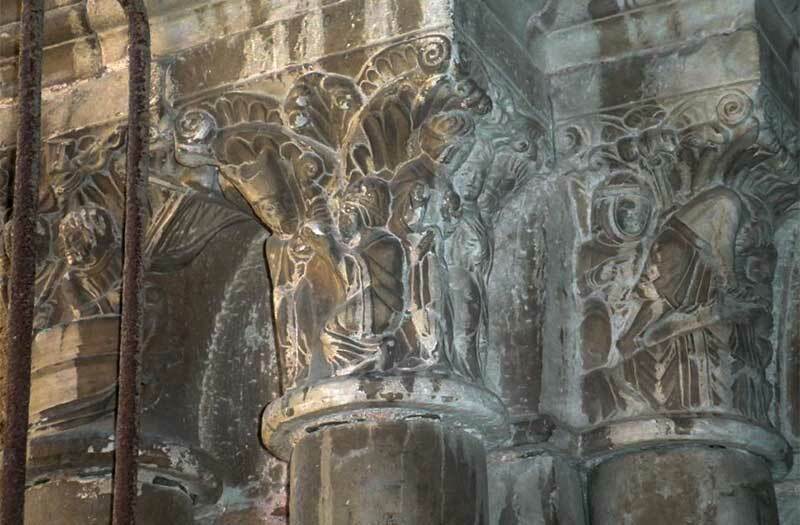 The columns supporting the archivolts have capitals with vegetable elements and scenes of the visit of the three Mary to Christ's sepulchre. The column of the mullion is also decorated with a reptile and with scenes of the life of Jesus. The tradition of the dancing egg is held at the cloister fountain since 1933. Christopher thanks for the photos. 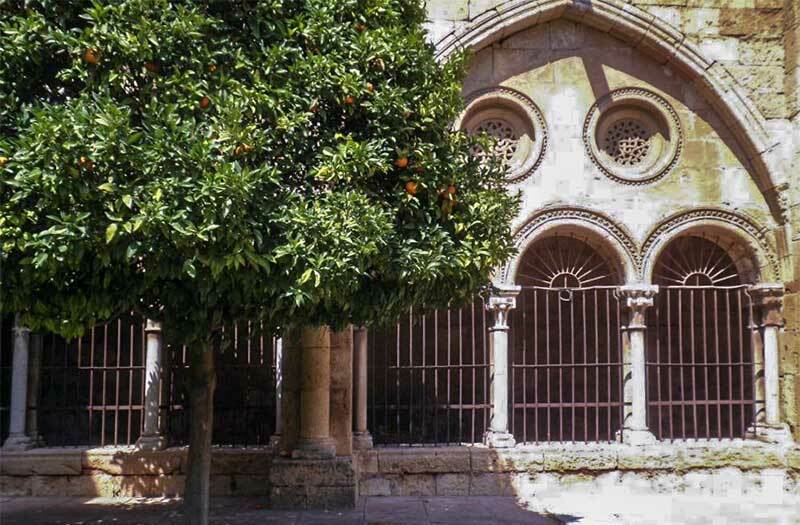 He notes that there are clear Islamic influences - pierced stone oculi above the arches, polylobed arches below the roof line, and, in the cathedral tower, arched windows of stone with glass roundels.and this cloister is also certainly on our list for a visit.